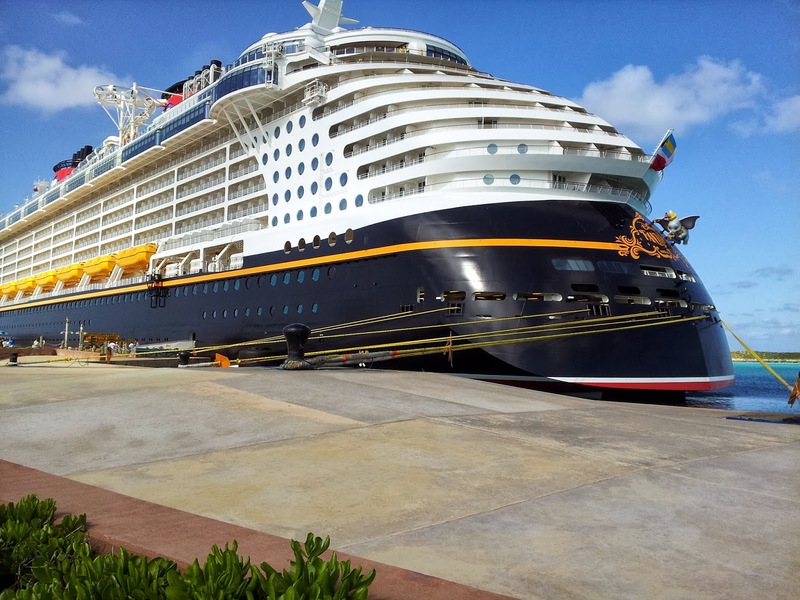 ﻿From the moment we step into the soaring atrium of Disney's Fantasy - their latest ship to hit the high seas - we feel like VIPs. 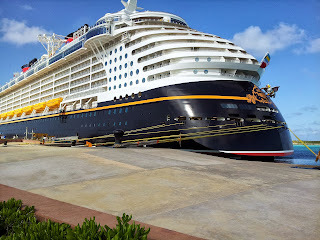 We approach the grand staircase - punctuated by an elegant bronze statue of Mademoiselle Minnie Mouse herself - and a crew member announces us over a loudspeaker. It's a little daunting as we've never been exposed to such "red carpet" fanfare. 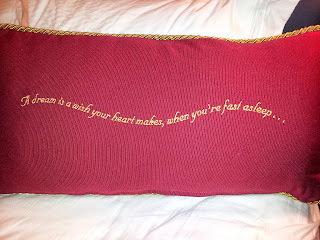 I can feel my 8-yr-old grandson Mateo shrink beside me. 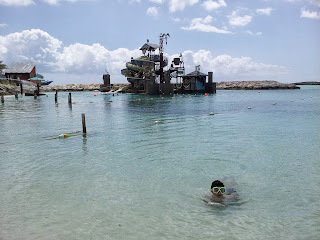 Disney is by definition for kids (and kids at heart) so I invited Mateo to accompany me on this three-day sailing to their private island, Castaway Cay. No stranger to the cruise experience (he already had five under his cap) I figured that his observations would give me a "youthful" perspective on this voyage. I wasn’t disappointed. I just hadn’t counted on the non-stop activity I would be exposed to. What was I thinking? We settle into our spacious cabin - complete with verandah - and I can sense Mateo's silent approval. He spies two cellular phones that family members can use to track one another while onboard and quickly voices his enthusiasm. "Now, we can call each other from all over the ship," he declares. Thankfully, Disney has dispensed with tiresome buffet lines. Mateo and new friend prepare for "launch"
﻿An hour or so later, we're in the middle of the “Sailing Away” party with Mickey, Minnie, Goofy, Chip and Dale and a host of other Disney characters cavorting around us. The ship’s horn blasts the opening strains to “When You Wish Upon a Star,” and we're off. My head is spinning with all the excitement, but Mateo is already eyeing the AquaDuck, the enclosed signature water coaster, that spins you up, down and around the perimeter of the ship via raging "river rapids." We head over there before the lines grow any longer. He seems grateful that I'm accompanying him on the maiden run. 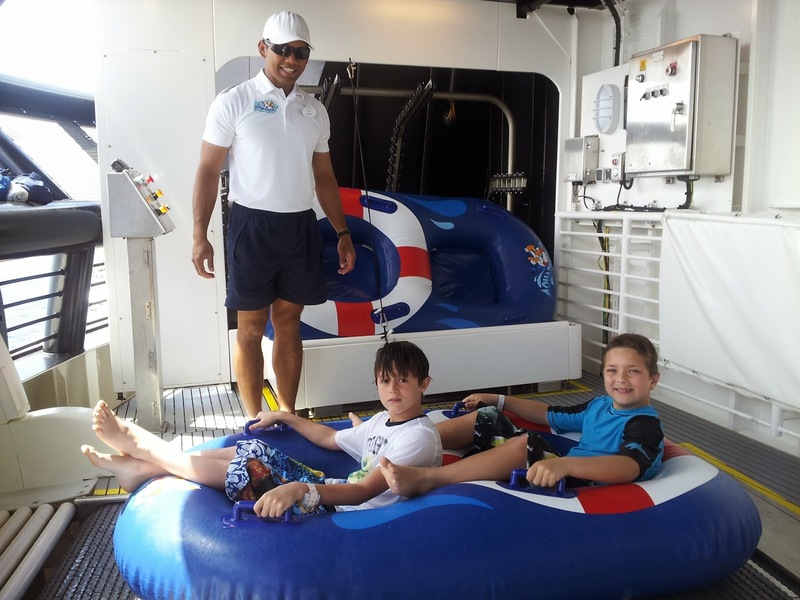 We climb into the rubber raft and a crew member asks: "Have you ever done this before?" "Well, if anything happens and you get stuck, don’t worry. Someone will be there to get you out right away,” he advises. I can hardly wait for the "launch," yet it proves to be an exhilarating ride. Mateo eventually makes “buddies” onboard and no longer needs – or wants - my company on the watery whirling dervish. Later, I catch sight of the adult-only "tranquility" area with private pools, hot tubs, cozy café, spa and collection of dining options and bars. As appealing as it is, I have to admit that I wouldn't have given up one minute of bonding with my energetic grandson for all the secluded sundecks in the world. 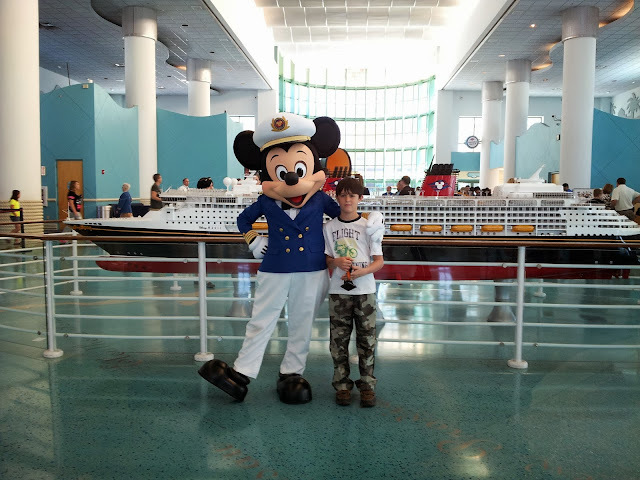 Disney offers a variety of kids clubs ranging from the Oceaneer’s Club and Lab for grade schoolers, to the Edge for tweens and the Vibe for teens. There’s even a “Chill Spa” for teens with age-appropriate treatments. Instead, he develops friendships with boys around the pool, the hot tub and on Goofy's Sports Deck with its nine-hole miniature golf course. I'm now on my own but he does check in periodically to apprise me of his next destination. The high-tech, Midship Detective Agency scavenger hunt is a favorite. We're given a “secret” card which brings specific artwork around the ship to life when we pass it and we're given clues which send us off to solve the ship's mysteries. I wonder out loud how it works. ﻿Disney's exclusive “rotational dining” which allows us to enjoy different restaurants each night, taking our servers with us proves to be a great bonding experience. We try all of the family restaurants: the ornate Royal Court, inspired by Disney classics “Cinderella,” and “Beauty and the Beast;” Enchanted Garden, a whimsical nod to the gardens of Versailles, and Animator’s Palate where your own art comes to life. onto the deck, launching a raucous pirate show. When the party ends one of the "Pirates of the Caribbean" movies starts on a LED screen. People drag out chairs and within minutes, the pounding pirate bash is transformed into a quiet movie-watching soiree. Our layover in Castaway Cay in the Bahamas the next day provides much to do for all ages, from kayaking to water sports, to beach massages. Mateo and I don life jackets for a snorkeling expedition and head out to deep water, where we follow a path leading to the "Nautilus" from "20,000 Leagues Under the Sea." The seas are strong and we struggle back to shore, when I feel a small hand plop on my shoulder as Mateo attaches himself to me for the "ride" back. After a very satisfying lunch and beach time, we head back to the ship. ﻿On our last evening, after Mateo shows me how the cell phone works. He has made plans to meet up with his new friend, 8-yr-old Mathew, from Seattle. He saunters away, phone tucked into his cargo pants, leaving me a wreck. True to his word, he calls me at the agreed upon time, to let me know that he's on his way back to the cabin. 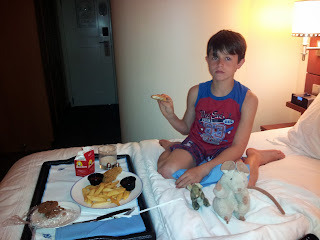 We take advantage of the 24-hr room service and order a snack - which arrives within a few minutes - before setting our bags outside the door and call it a night. 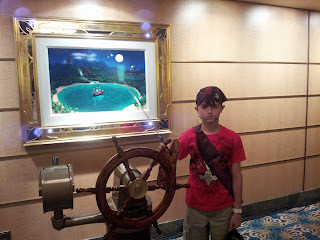 While disembarking the next morning, I ask Mateo if he enjoyed the Fantasy and if he would sail with Disney again. I couldn't agree more. Was it relaxing? Not really, but would you expect anything less when traveling with a child on a Disney cruise? Was it fun? You bet! What a great idea Disney had by providing phones so that adults can keep up with the children. Brilliant! (I'm not sure why my Google identity isn't showing up. This is Donna Hull from My Itchy Travel Feet). Sounds like a great experience for kids. It really is. I highly recommend it if you have "little ones." Even adults enjoy all of the entertainment, the food etc. How wonderful it is to be able to travel through the eyes of a child! It truly is the best! They're so innocent and not at all jaded like "we" are. Children also point out things that adults tend to miss and they find joy in everything. I love traveling with my grandson. From what I've been hearing, Disney really does these cruises right. 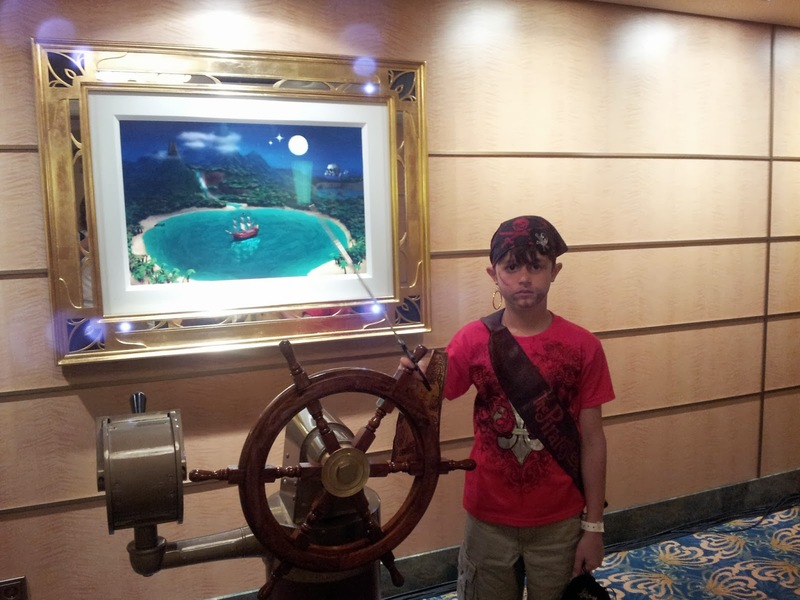 I think my stepson's family would really enjoy this cruise, the huge Disney fans that they are! I think I'd have to skip the rapids since spinning up, down and around isn't my thing, but I'm sure I'd find lots to do (checking out all the restaurants would certainly keep me busy). I'm sure that you would enjoy the experience. While I happen to have enjoyed the Aqua Duck, the shows and other entertainment are enough to keep anyone going. I especially enjoyed the Pirate Night. I encourage you go try it. There really is something for everyone.